I did some mixes with Proximity plugin and I think it’s just amazing! 🙂 If you want to add something to track but don’t know what, just add Proximity! Also check official [Proximity plugin page]. EDIT: Mac version updated too. Thanks to Murray Campbell for reminder. Check this screenshot of simple project with a lot of Proximity instances. 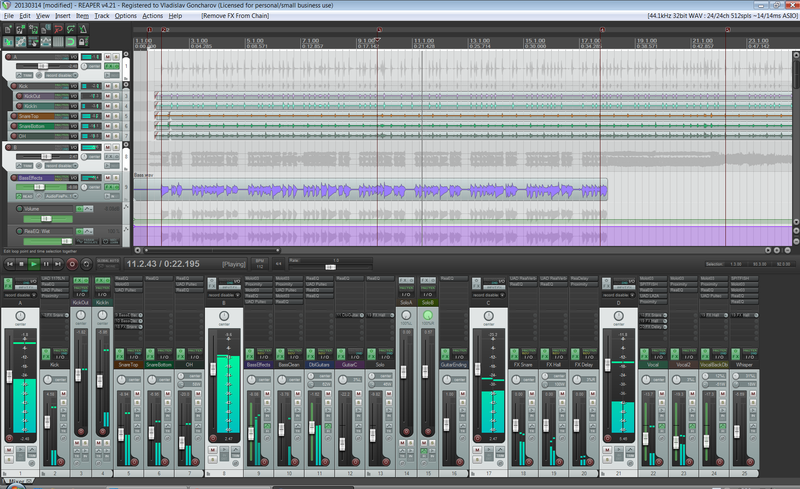 You can see Proximity on bass drum, bass guitars, guitars double track, reverb channels, lead and backing vocals! A: In short, when the sound doesn’t play, the plugin starts to use several times more CPU power. It’s related with processing of very small numbers very very close to zero (less than -600 dBFS). Q: Molot 0.3 didn’t have such problems, so why they were added to version 0.3.1? A: This bug is related with combination of new limiter code and auto-off feature. Q: What is auto-off feature? A: When there’s no input signal, the signal processing code is bypassed. If it happens, version string on GUI becomes gray. PS. Reaper performance meter is a good tool to detect such problems! And also thanks to Theo Niessink! EDIT: And Marc Abram too. PPS. Also I found the same problem in Proximity plugin. Update shall come soon!